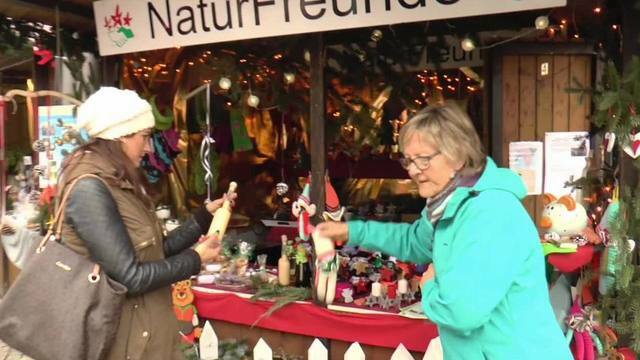 For this week’s lesson, we wanted to look at some more examples from the video Unterwegs mit Cettina: auf dem Bruchsaler Weihnachtsmarkt. One of the lovely things about these markets is the fact that one can find so many “homemade” and “handmade” items, which was expressed in a number of different ways in the video. In a spirit of solidarity with the people of Berlin and German holiday traditions, let’s take a look at some of the phrases that were used for our future Weihnachtsmarkt visits! You may have also seen "selber" used instead of "selbst." This is not incorrect, but certainly more of a slang expression. Oh, super. OK, also alles... -Ja, also, isch [ist] alles selber gemacht. Oh, super. OK, so everything... -Yes, so it's all homemade. Ist alles von den Eltern und von den Omas selber gebastelt. It is all made by the parents and the grandmothers themselves. Selber gebackene Plätzchen. -Oh, lecker. Home baked [Homemade] cookies. -Oh, delicious. In these examples, we can note that there are specific ways to express “homemade” or “handmade” based on the item in question and how it is created. It is good to familiarize yourself with these various phrases, because the adjective hausgemacht is actually more specific than the English word "homemade." This word is particularly used by restaurants or cafés for items that are baked or cooked on the premises. According to Duden, it is preferable to write adjectives other than hausgemacht as two words when they precede a noun, for example die selbst gebackenen Kekse ("the homemade cookies") or der selbst gebastelte Engel ("the handmade angel"). Most importantly, don't forget the appropriate ending (declension) for the adjective! Go to Yabla German and review examples of selber and selbst as they are used in other contexts. Indeed, these words are more often used completely removed from this context to describe an action a person has carried out themselves personally.